* Cable: Choose Options 50 ft. (included & no charge) 100 ft. 150 ft. 200 ft. The AquaMaster Fountains (Aqua Master Fountains) Classic LE Series is the newest additions to the AquaMaster product line. This highly affordable and durable 1/2 HP AquaMaster Classic LE Fountains are constructed with high quality, corrosion resistant components and propeller technologny. The power unit propeller, debris screen, and fasteners are all made from 300 series stainless steel to provide longevity. The custom, oil cooled motor operates at an energy efficient 5 amps with 120 volts. Housed in a stainless steel canister, sealed with a stainless steel base plate and seal hub assembly for long lasting, trouble free operation. Four Interchangeable Spray Pattern Displays - The base model design utilizes the conical, Standard High Volume display without a nozzle. The two-tier Crown & Geyser, the tight Geyser, and slightly wider Wide Geyser utilize different nozzles that are easily interchangeable. Nozzles must be purchased separately. High Performance Power Unit - The base model design utilizes the conical, Standard High Volume display without a nozzle. The two-tier Crown & Geyser, the tight Geyser, and slightly wider Wide Geyser utilize different nozzles that are easily interchangeable. Nozzles must be purchased separately. The custom, oil cooled motor operates at an energy efficient 5 amps at 120 volts. It sits in a stainless steel canister and sealed with a stainless steel base plate and seal hub assembly for long lasting, trouble free operation. An Aqua Lock quick disconnect is available as an option if desired. Superior Quality - The new, built to last, 1/2 HP Classic LE is constructed with high quality, corrosion resistant components utilizing propeller technology. The power unit, propeller, debris screen, and fasteners are all made in 300 series stainless steel to provide longevity. More on AquaMaster - AquaMaster (Aqua Master) is recognized throughout the world as one of the premier manufacturers of pond fountains and aeration equipment (pond aerators). 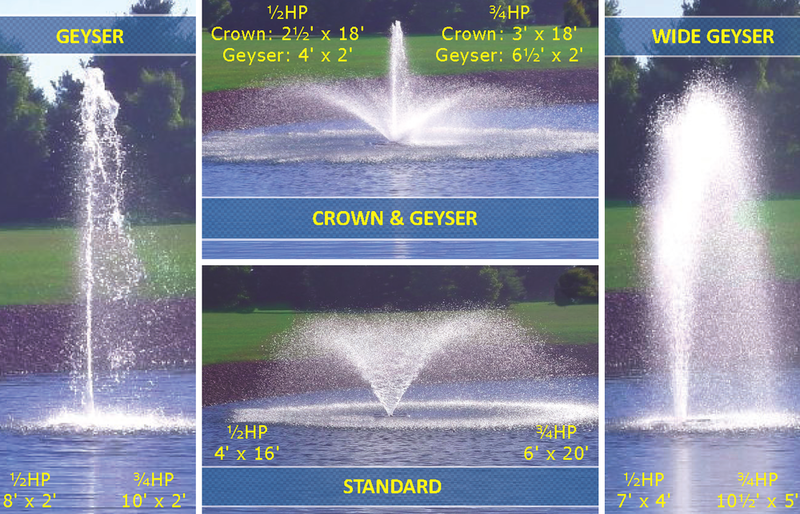 AquaMaster carries three lines of floating fountains: Classic LE Series, Masters Series, and Celestial Series. In addition, AquaMaster has five different types of pond aerators and lake aerators: Oxymax Series, Ultimax Series, Volcano Series, Hydromax Series and the AquaAir Series. Aqua Link is an Authorized AquaMaster Fountain and Pond Aerator Distributor & Service Repair Center.